The split Holiday weeks of Christmas and New Years tend to lengthen the time it takes to complete our Newsletter and quarterly reports. This year was no different, not to mention we again went with a 50% larger Newsletter this quarter than in recent past. In years of extremes we feel it very important to share our detailed views, estimates, and analysis with you for a clear picture of our thoughts, with the added benefit of clarity it brings us for completing. With ten graphs …. yep you read that correctly, TEN graphs for further explanation and detail, we hope you enjoy this Newsletter a lot. Our editor did not as the afore-mentioned graphs created their own challenges. We thank you again Kathy! Goldilocks, Little Red Riding Hood, Look Back, Preview and Review along with our best estimate on some VERY unexpected items to come in 2014 are included for your perusal. Oh … and we FINALLY get the tax calendar correct with a tax related reminder article for your viewing in this issue, rather than next quarter, which arrives in mid April, far to close to tax filing deadlines. Today is a Friday and we hope you have enjoyed your first full week back from the holidays. It is nice to get back into the routine, no matter how unusually chilly it has been. Monday brings the first of several out-of-state travel adventures in the next few weeks, but not to worry technology tether is a terrific thing, and the team at the office always has our backs. 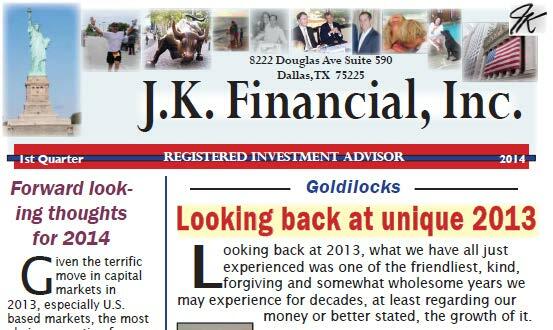 This entry was posted in Education, Investing/Financial Planning, Newsletters and tagged Goldilocks, J.K. Financial Newsletter, Little Red Riding Hood, Newsletter, Preview and Review. Bookmark the permalink.